Recurrent decay can be detected by looking for the subtle changes occurring in the coloration of the enamel surrounding the restoration. Enamel is like opaque glass. You can’t see what’s on the other side, but you can see if it is brown or black. For the most part, darkened enamel around a restoration is an indicator of recurrent decay occurring under the cusp. In the case of an amalgam restoration, we know that you cannot severely undercut enamel cusps and fill with amalgam. 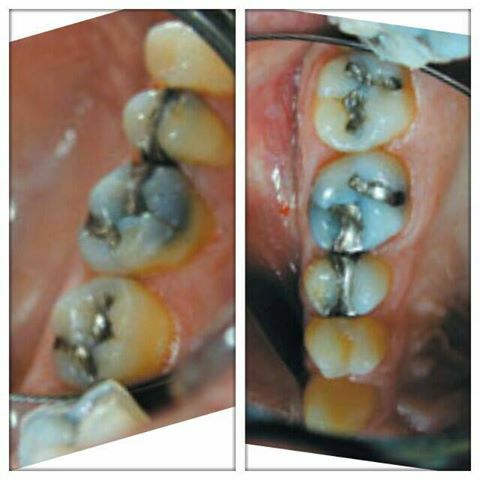 This is why thin cusps need to be shoed when using amalgam. So, when we examine the tooth from the occlusal we know that the amalgam restoration extends almost straight down. Severe undercuts are not allowed. Therefore, how is it possible to think that the black or brown enamel beside the restoration is amalgam shining through? What you are looking at is recurrent decay through a frosted window (enamel). Recurrent decay will not generally start along the whole occlusal margin. So, you will see that the enamel is discolored in one area but not in others.Another telltale sign is small cracks forming in the enamel, especially if they are in a discolored area. Enamel is much like glass hard but brittle. Place glass on a solid smooth floor and you could jump on it and it won’t break. This is analogous to enamel supported by healthy dentin. Place the same glass on a pillow and it will crack. Enamel that is cracking in the presence of discoloration is enamel supported by decayed dentin.